– Customized hardware/software bundles available. – Chose from dedicated HMIs (GP4000/SP5000), Windows open HMIs (SP5000), all-in-one HMI/PLCs (LT4000M), or handheld HMIs (GP4000H). 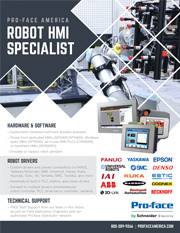 – Custom drivers and proven connectivity to FANUC, Yaskawa Motoman, ABB, Universal, Denso, Kuka, Hyundai, Estic, IAI, Yamaha, SMC, Toshiba, and more.